This is an older painting on which the more recent drawing on my blog was based. For me, it was a turn-around on my humans to plants theme; here the plant is adapting to the human world of structure. I called it ruby tree because of the ruby earrings and the color of the bark. Since then I have discovered that there are actual trees called Ruby Horse Chestnut trees. Who knew? 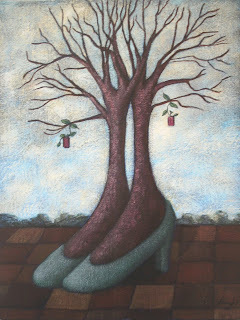 I see growth, a tree that has been planted in the shoes of human design. Maybe its something thats been left over and new life is forming. Or its just some shoes that have some soil in them and now there are plants growing.